Remember me? Remember that I worked with my Ulitmate Dress Pattern for a couple of months, made a sky blue dress and then nothing more was heard of this pattern? Well, I wasn't too pleased with the fit. It was ok, but... And due to my (for me) intense workouts, my body changed overnight again (it's strange that it isn't happening slow and steady but rather huge leaps at a time) and the fit was even worse and I didn't even want to look at the dress again. So I tried a pattern from BurdaStyle and it was a bit small in the bust area and a bit big over the hips and I really didn't like all that fabric / draping so I did a toile of Gertie's wiggle dress, and the bust area was probably ok but HUGE over the hips (and I was a bit lazy while copying the pattern and didn't adjust any measurements) and then the pedal of my sewing machine broke and I sewed half the toile by hand and I just wanted a dress. So I tried on the sky blue dress again to see if I perhaps might be able to work some magic. I've been working in baby steps the past month. 15 minutes here and there, fixing the pattern. Trying to decided which fabric to use. Ordering zippers and bias tape. Steaming the wool once I've settled for the black crêpe from Lisbon. So in a break from the Christmas celebrations I started to mark and cut my pattern. I've forgotten how much I love it (being at least two months since last time...). 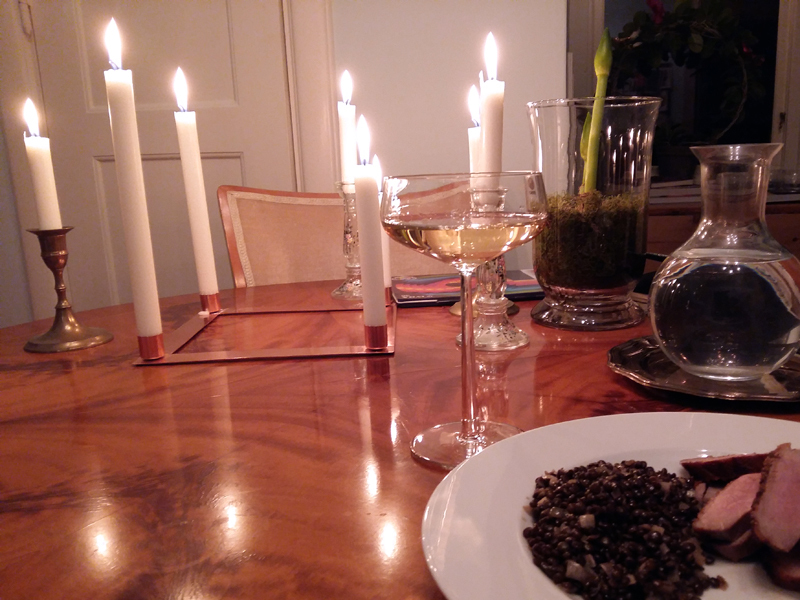 Then I took a break with some champagne, duck, beluga lentils and Life in Squares. Beautiful.